How Big and Expensive is a 15kW Solar System? You’ve done some math or maybe you’ve talked to an installer and found that a 15kW solar system installation will cover your electricity needs quite nicely. Great! But there is one problem. You’re scratching your head, wondering what exactly does 15 kW mean? And even more importantly, how big and expensive is a 15 kW solar system? Let’s look at all this today and find out if getting a 15 kW solar system is right for you. Before we move on to our discussion of 15-kilowatt (kW) installations, let’s take a moment to discuss something that’s not as cool or exciting as solar, but can save you some serious cash in the long run. Installing solar is a great financial decision, but did you know that energy efficiency measures are the most cost-effective method of saving money on electricity? Weather stripping around doors and windows, strategically adding insulation to certain areas of your home, replacing incandescent light bulbs with LEDs, and installing low-flow faucets and showerheads (if your water heater is electric) are all inexpensive options that can drastically drop your total electricity use. Don’t know where to start? Many utilities offer rebates on energy audits, where a technician walks through your home, tests, and inspects windows and doors for leaks, HVAC for inefficiency, and insulation levels. After the audit is complete, you get an itemized (and prioritized) list of what steps you can take to lower your energy use! And after you’ve completed those steps and reduced your use, you can install a smaller solar system as well, saving you even more money over the long term! How big is a 15kW solar system? What does 15 kW actually mean? A 15 kW solar system can produce 15 kilowatts of power in a single instant. To understand how big this installation really is, consider that your laptop when it’s plugged in and running uses about 30 watts, so a 15-kilowatt system (or to say it another way, a 15,000-watt system, since 1 kW equals 1000 watts) performing at its peak could power 500 laptops! In the real world, weather, temperature, solar panel soiling, and your wiring and equipment all affect how much electricity your installation can actually produce. The National Renewable Energy Lab, in their online solar calculator PV Watts, recommends decreasing total electricity production by 14% to account for all these losses. So, in reality, a 15 kW installation really only produces around 12.9 kW. That’s not to say a 15 kW installation doesn’t produce a lot of power. Case in point: in Colorado, a 15 kW installation produces about 12,907 kWh annually. With an average usage of 8,256 kWh per year in the state, a 15 kW system would cover almost 160% of the average home’s electricity usage! A quick note: Most utilities cap the size of solar installations to cover 100% to 120% of a home’s total electricity usage, so a 160% offset probably would never happen in the real world. If you really did use about 8,256 kWh per year, a system much smaller than 15 kW would suit your needs better! 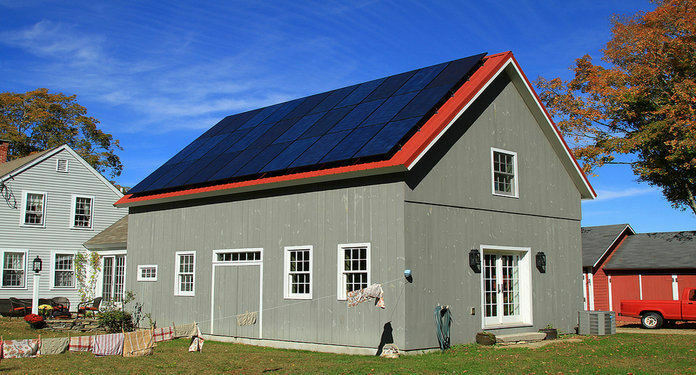 Here’s an example of a 15kW solar system. Bargain-bin panels typically see efficiency around 14.5% and put out about 240 watts each, so a 15-kilowatt installation would need a whopping 63 panels. Most homeowners install mid-range solar panels like Hanwha’s Q-Cell, which balance higher efficiency (around 16%) with cost. At 265 watt each, you’d need about 57 panels to add up to 15,000 watts. High-efficiency panels like SunPower’s X21 series can produce up to 345 watts, so you’d only need 44 panels to create a 15-kilowatt installation! If you’re crushed for space on your roof and don’t mind the additional cost, high-efficiency panels allow you to pump out much more electricity than mid-range or low-range panels. Residential solar panels are typically about 65” tall by 39” wide (about 3’ x 5’), leading to a total area of 17.6 square feet each. The total area then of 57 panels equals 1,003 square feet, or about 10 four-door sedans (think Toyota Camry or Honda Accords) parked in a row. If you’re in your front yard wondering if you can fit a group of 10 cars on your roof, don’t worry! You have options. 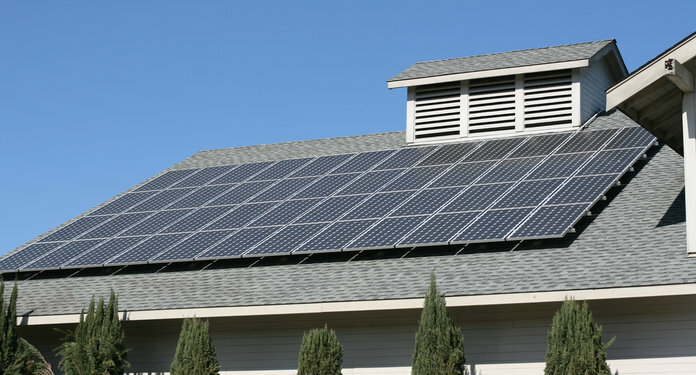 With typical string inverters, all your solar panels need to be grouped together facing the same direction and angle. As you can imagine, with large solar installations this presents a problem. Who can fit 57 panels in a single area on their roof? 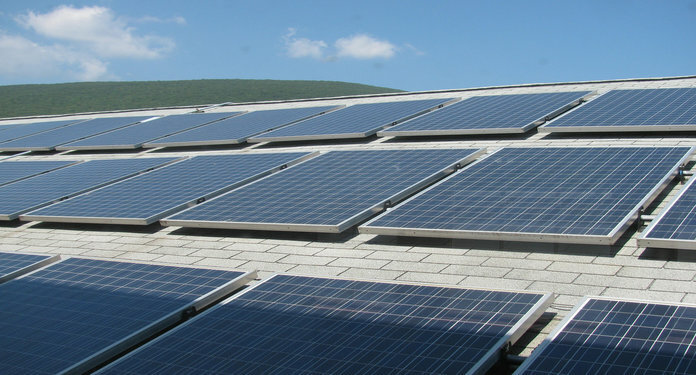 With special inverters known as microinverters though, which optimize each panel individually, you can place panels all over your roof, at different angles and facing different directions (typically in groups of 3 panels or more). They are more expensive than more common string inverters, but if you’re pressed for roof space, they really open up the possibilities! How expensive is a 15 kW solar system? The average installation cost for residential solar, according to a 2016 report from the National Renewable Energy Lab, is $2.93 per watt. So if you purchased a 15 kW system in cash, you’d pay $43,950. Yes, quite a bit of money, but let’s see if we can bring that cost down and then put it into perspective. First off, all homeowners who purchase their own solar system are eligible to receive the 30% federal tax credit. Applying this credit immediately drops your total out-of-pocket cost to $26,370 – much lower than the original amount, but still pretty high! The real question then is, how much money can you save by installing a 15 kW system? Finding that out is pretty easy! We just need to know how much electricity a 15 kW installation produces and how much that electricity would cost if you purchased it from the utility. Since we’ve already know a 15 kW installation in Colorado produces 12,907 annually, let’s just use that. In Colorado, the average utility price is $0.1212 per kWh (To find your specific utility rate, just check your utility bill). If we purchased 12,907 kWh at $0.1212 per kWh, we’d spend $1,564. Solar installations typically last 20 to 30 years, so we’ll say that our 15 kW installation will produce electricity for 25 years. Solar panels typically drop in efficiency about .08% each year, so at the end of 25 years, our 15 kW installation will have produced 319,596 kWh total. Nice! Now let’s find out how much 319,596 would cost from the utility. Utility rates generally climb about 2.5% each year, so we’ll factor that in as well. Accounting for that rate increase, if you purchased 319, 596 kWh from the utility over the next 25 years, you’d spend $52,870! Woah! To find your savings, just subtract your initial investment of $26,370 from $52,870 to find a total net savings of $26,500! Now that you know the savings you can see, that initial $26,370 isn’t looking too bad, is it? Think about what you could buy with over $25k in your pocket! If you finance through a loan, lease, or PPA your savings will be lower, but these financing options allow you to avoid that high initial investment. And of course, you’ll still save thousands of dollars too. So if you want to go solar but don’t have the dough to pay for it outright, check out these other financing options as well! You can easily work out your own savings estimate using the steps above as a guide and NREL’s PV Watts calculator and a spreadsheet program like Microsoft Excel or Google Drive. Did your own calculations or have any follow-up questions? Let us know in the comments below!